When applying TWP Wood Stains for the first time to new wood there will need to be proper steps taken. New smooth wood or decking is not ready to be pre-stained prior to installation or stained right after installation. 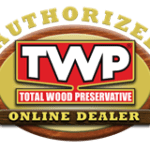 It is best to follow the directions of the TWP Wood Stain when it comes to applying a coating to new wood for the first time, not the lumber yard or the paint store’s as they do not understand the proper prep needed. It is important to understand that new smooth wood is not absorbent enough for the TWP Stains. New wood contains a higher moisture content and a “mill glaze”. Mill Glaze is a waxy film that results from the fast turning blades that cut the profile on a manufactured log. The high speed of the turning blades produces heat that draws sap and moisture out of the log. As it cools and dries, it creates a film or coating on the logs. This will hinder the TWP’s ability to penetrate into the wood grain. 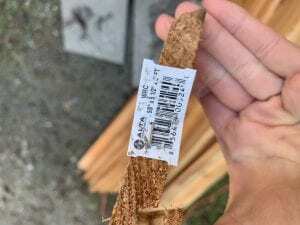 Note: New Rough Sawn vertical wood/fencing can be stained right away with no wait and with no prep as it does have mill glaze and is very absorbent. Just make sure the wood is fully dry. If Rough sawn wood has aged or oxidized (grayed) then it will need to be prepped with Gemini Restore Kit. One coat for most instances of newly installed Rough Sawn wood. TWP wants the wood to weather and dry out for 4-12 months after installation. This will allow the moisture content to drop and the exposed wood cells will oxidize from the sun’s UV, turning slightly gray. After letting the wood weather it is time to prep the wood. This step consists of using the Gemini Restore A Deck Kit. This kit contains both a Step 1 Wood Deck Cleaner and a Step 2 Wood Deck Brightener. The Step 1 cleaner will help remove the dirt, graying, and mill glaze from the wood while Step 2 Brightener will neutralize the cleaner and help restore the natural color. Even after the waiting period and the proper prepping, new smooth wood is still not as absorbent as it will be in a few years. We strongly suggest only applying 1 coat of the TWP Stains the first time. Do not over apply as the TWP may not penetrate into the wood correctly. Make sure to back wipe any excess stain that does not penetrate properly into the wood after 30 minutes. Use the for new smooth wood, the TWP 100 Series if allowed in your state, otherwise use the TWP 1500 Series. Apply a light maintenance coat to the flooring in 9-24 months. If just slightly dirty prep with soapy water to remove grime and reapply one light coat. If you wait 18-24 months make sure to prep again with the Gemini Restore A Deck. After the first year or two, your wood will be able to absorb more TWP stain which results in a longer stain life and protection! 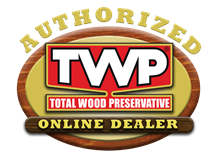 TWP is a penetrating wood preservative. It performs properly when it penetrates 100% into the wood. Over applying will not result in longer protection. Have a Question? Please Ask Below. Stain both areas with the TWP 100 Series or 1500 Series. Kiln dried clear redwood, can I lightly sand, wipe off, then stain? Clean and recoat every few years. No need to strip. Thanks. Can you give me an idea of what kind of shelf life the leftover cleaner and brighter will have? Hi all: Last October I purchased a sample of the TWP 100 and it is awesome! I thought when a person buys that-they had a small credit towards more? If so-please let me know how. Do I need to let new t1-11 siding weather before staining with 1500? No. You have to install, weather 4-12 months, and then prep. It cannot be prestained. Your wood has not been exposed to natural weathering and it is not just about drying but about opening the wood grain naturally and removing the mill glaze. It is not ready in the current state. As long as the rough sawn wood is clean and dry then yes you can stain right away. Only need to stain the exposed wood. Yes, you must prep. Use the Gemini Restore Kit. Interesting that your article above under Maintaining says “Apply a light maintenance coat to the flooring in 9-24 months. If just slightly dirty prep with soapy water to remove grime and reapply one light coat.” I assume the time length should have been written as 9-17 months, as the next catagory is 18-24. So, is it true that the first 9-17 months the deck can just be washed with soapy water as prep or not??? Thank you. To just remove dirt and grime for a maintenance coat, yes. I need to provide a clear finish over a porous redwood slab to enhance its unique texture for an art piece. Waxing the material is not satisfactory due to its very porous nature. Need suggestions and help. Thanks. The TWP will not work for this nor does the Cler enhance the wood grain. Have a large deck that we did with TWP 1500 6 years ago and is in need of redoing. Going with TWP 100 this time as the wife wants Grey. Do I need to use RAD or Gemini for my prep? Second question…I have 2 bad boards that I need to replace. I know I’m supposed to wait 8-12 months for the new board to weather before staining it but that’s going to look terrible for this summer. Any options? You will need to strip. Use the Restore A Deck Stripper/Brightener Kits. As for the new boards, go ahead and do them now. Worse case is you will have to apply another coat to them in 12 months. Prep first with the Gemini Restore Kit. Can we purchase it locally? And can I get a color brochure? We are building a new deck and porch. Is there a way to get the colors available mailed to us to decide on the color? We have a brand new “yella wood” pressure treated pine deck which is about 4 months old. Before staining (and we will be buying TWP stain), I intend to purchase a moister meter to determine the “wetness” of the wood. Can you advise as to the maximum percentage of wetness that would allow for properly staining this type of deck? Also, would you be able to suggest a reliable brand of moisture meter for me to purchase? 15% or less is normal but you really do not need one. Just prep the wood accordingly and let dry for 48 hours without any rain and you will be good to apply the TWP stain. I have read that it is wise, if possible, to stain both sides of cedar siding. (We have not yet installed it yet). It is also easier to apply stain to siding before installing it because you don’t have to be as careful about getting it on the trim. However, you recommend letting the wood weather before applying stain. 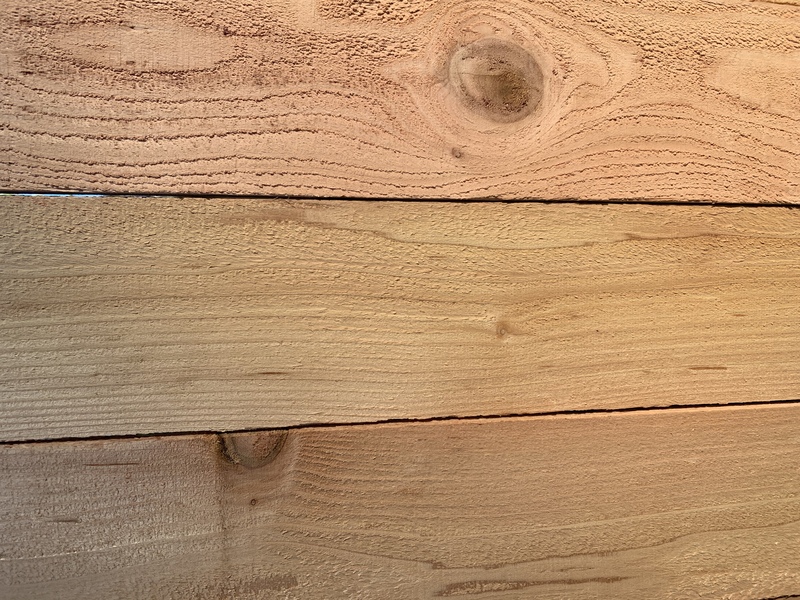 What do you think about the importance of staining the backside (and top/bottom edges) of beveled cedar siding? No need to stain all sides nor would it help in any way. Only need to apply the TWP to the exposed wood after install, wait, and prep. 5 years ago my husband used TWP for the deck. He died 3 years ago and the deck needs to be stained again. I would love to use the color stain he used. How would I be able to find that out? The color would be on the container if you have that. If not, we can try to guess but we will need you to post a picture or two. We have just sanded the old Sherwin Williams stain off our 3 yr old redwood deck. We are ready to go with TWP stain. Do we need to prep it with anything first? Yes, use the Gemini Restore Kit for the final prep about 2-4 weeks after the sanding. Yes. Sanding “closes” the wood pores, reducing stain penetration. Waiting a few weeks and then prepping will “open” the wood pores so the TWP can penetrate better into the wood grain. We are using TWP on v grooved pine under our front porch . What grid sandpaper do we need to use before applying the stain? New wood is not prepped by sanding. It needs to natural weathering and then use the Gemini Restore Kit for the prep. That is smooth cut wood. Need to weather and prep. The closeup does show that it is rough sawn cut. You can stain now. Only in TWP will the 300 Series work for bamboo. You will need to order it online if your local store will not bring it in. Search Google for “TWP 300 Series” and you will see your options. 1. Depends on where you live in AZ? The 100 is restricted in PHX area. Use the 100 is you are outside there if not, the 1500. Just one coat. 2. Yes if smooth wood. 3. No need to stain backside. Just the exposed wood. Are there any short cuts to staining new cedar decking and getting past the mill Glaze on a new deck? 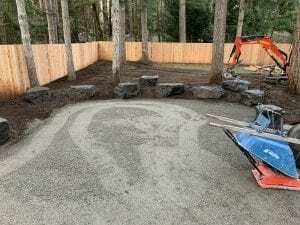 What if I were to sand the cedar ? Would that eliminate enough mill glaze to accept a deep staining ? Nope. You have to weather and prep. Sanding actually hinders the stain absorption if sanded too smooth. I applied TWP 100 to the deck and it’s not as dark as I’d like. Should I wait 6 to 9 months to apply a maintenance coat in hopes that it will turn out darker or can I do it sooner than that? You should wait the 6-12 months and prep with the Gemini Restore Kit. 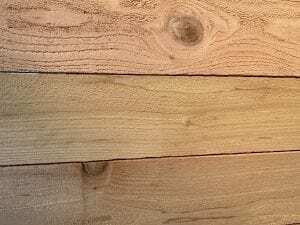 We are using a combination of Rough Cedar, Pine and KDAT decking for a new porch and deck. Do you recommend the same waiting period and cleaning process each of these? Yes. Wait a few months to prep and stain. My newly installed PT deck (Sarasota FL) is drying and next fall I will use either the 100 or the 1500. Your Q-A’s are very informative and I wouldn’t even consider anything but the Big Box Store products. Love what I’ve read. I am concerned, however about the slip/fall risk when the deck is wet. What are the recommendations to reduce the slipping hazard? TWP is a penetrating stain so it does not dry on top of the wood, creating a slipping hazard. Our builder has just put Cypress wood on the front of our new build. We live in central Florida, on the water. Is TWP the stain and sealer we should use? I believe we are a voc state (we weren’t listed as a no-voc state). Will #100 TWP be correct to use on exterior Cypress wood? I think it was “young” Cypress. It is a honey color, but we will be staining it somewhat darker. Our roof is reddish brown, shingles. You would want the TWP 100 Series. Wait until Spring, prep with the Gemini Restore Kit, stain with 1 coat of the TWP 100 Series. Want to put new p.t. 2x’s on my trailer. Do I need to let them weather before applying stain. If so how long. Also what series do you recommend as the trailer will be exposed to the elements. Living in Mo. Yes. The article above states how long and how to prep. Use the TWP 100 Series. 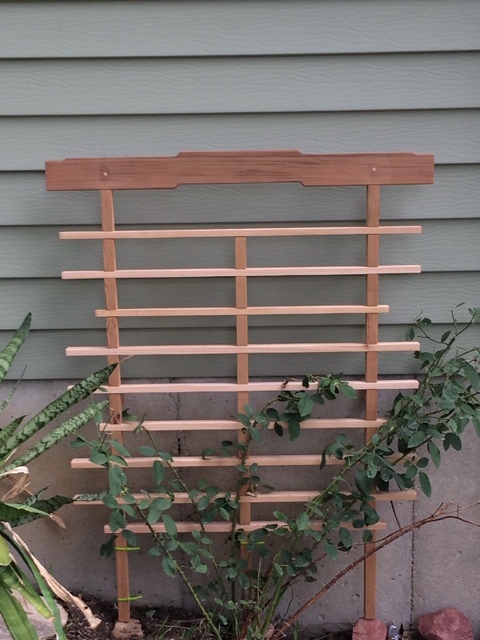 I have a new horizontal board rough dawn cedar fence (installed under a month ago, in Missouri). Should we treat it now without any prep work, or wait until spring and prep with the Gemini product before? Priorities are preventing mold and preserving color. Which series would be best? You could do either. Now if you have time and the weather works or wait until Spring. Use the TWP 1500 Series for the fence. One week ago we built a new redwood deck in the San Francisco area. It seems that your advice would be: (1) do not apply TWP for at least four months, (2) in the meantime, leave the deck exposed to winter rain, (3) do not walk on the deck with dirty shoes until after we apply the TWP, (4) use Gemini RAD before applying the TWP. Do I understand 1-4 correctly? Additional question: One comment about the Gemini RAD mentions power washing. I’m a homeowner, without any “power washing” equipment or experience. Maybe I’m out of my league? Yes, that is correct. You can rent a pressure washer. Does the stain need mixing or shakened after sitting in unopened container for three months? Yes, you have to mix it. You can buy a 5-gallon drill mixer at your local hardware store for about $5. Attaches to any drill. Very easy. About to stain my new P.treated pine deck with twp100 dark oak after 12months weathering….there are a few ink stamps that i forgot to sand off… any concern with sanding small areas b4 i clean & prep? If you spot sand them now, your stain will be lighter in those spots. It would be better to sand now, let the wood weather to Spring, and do the prep/stain then. Wood filler will not work with deck stains. TWP will not stain to blend the filler with the rest of the deck. It will look bad. Just leave it as is. No need to fill. Thx… if ink stamps are 50% faded on treated pine… do u think dark oak would hide them without sanding? No, you cannot hide them with the stain but it is possible that the cleaner will remove them if the spots have faded a lot already. You could try a spot and see. It is on the website. Just click the link. I have a railing I need to put up on a deck. It is hemlock. I am using TWP101 to stain the deck. The railing needs to be sanded. One, after sanding, do I need to apply a pre-stain wood conditioner? Two, after I apply the TWP101 stain should I apply a sealer such as a spar varnish to protect the wood? Thanks. 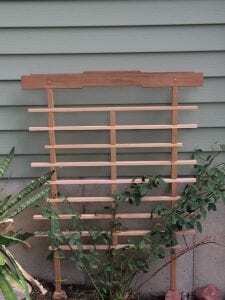 You will need to install the wood, let weather, prep, and stain as the article above states. You cannot pre-stain with a conditioner nor can you top coat the TWP after. Do you think the ceiling will look drastically different from the rest given the different types of wood? Hard to say. Maybe a little but not a huge difference. Deck built in January of this year. PT wood with tongue and groove non-PT ceiling in the covered portion of the deck. I bought dark oak 103 for the entire project. I’m wondering if cleaner and brightener will be necessary on the ceiling wood. Do you think the ceiling will look drastically different from the rest given the different types of wood? Can you send me a link with instructions on how to apply the cleaner and brightener? 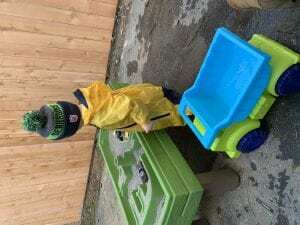 No pressure washing required if I use the Gemini kit? After staining this year, apply another light coat in 12-18 months. Then every 2-3 years after that. TWP 100 cannot be shipped anywhere in Ohio. Only the 1500 Series. By the way, I will be very annoyed if after sending this message, I get a lot of SPAM from your company. I will not buy your product if that happens. You must remove all of the Cabot prior to using the TWP. The “Clear” will not provide UV protection from graying. You must use one of the semi-transparent colors. Honeytone is the lightest tint. We do not SPAM people. I bought TWP 1500 Pecan. The wood on my back porch is 15 years old and has never been stained. Just treated wood. I power washed it last week-twice. But now our temps have fallen from the 80’s to the mid 50’s and 40’s at night with rain. I have a three day break from the rain. Is the three day break and these lower temps good enough for proper staining my porch with no overhang? Bleach should work to kill the mildew on the undersides. As the article above states, you will need to wait longer than the 2 months. 4-12 months and then clean and brighten for the prep. You do not have to sand fore prep. Use the TWP 100 Series. One coat the first time. 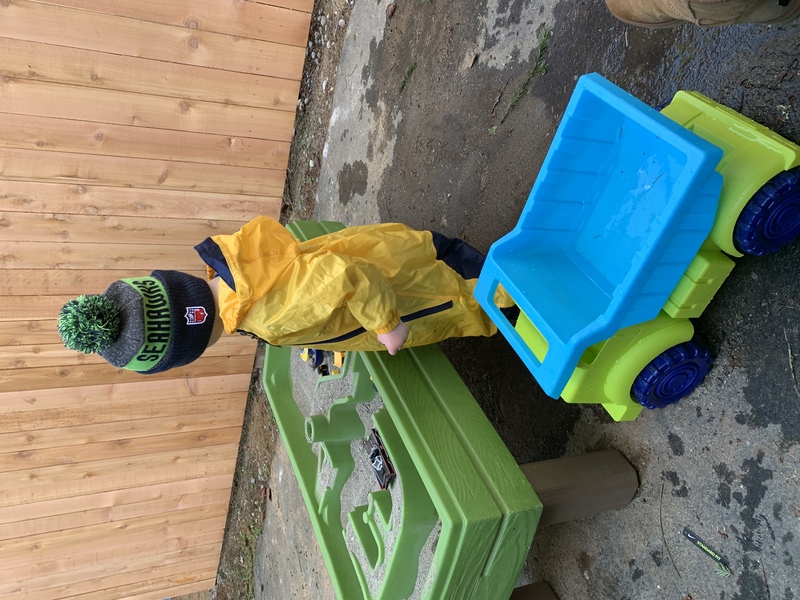 I plan on using a airless sprayer to apply your product to a deck I built and let weather for 18 months , it’s been power washed and looks abundantly dry . Will this method of application work ? Yes, but you should back wipe to make sure it is evenly applied. Just let it dry for 48 hours and you will be fine. Yes, you will have to prep again. Lightly clean and brighten the wood. Hi.I understand the need to let P.T.wood dry out for a long time but what about cedar? The cedar Decking I used is dry (kiln dried) and 2 months installed now. Do I still have to wait 6 to 12 months? Or can I just use a cleaner and then stain it? Yes you will have the wait the 4-12 months. I am reading conflicting advice for kiln dried cedar is the wait time still 4-12 months or just 1 month? If KDAT, you can do sooner. New cedar fence (rough sawn), completed in May 2018. Wood stored indoors all winter prior, thus fully dried on install. Has weathered all summer. Ever so slight silvering, no heavy oxidation and still retains natural cedar color. Ordered 10 gallon of 1503 stain. With this being a new wood install with very light silvering, can the fence be pressure washed only to remove dust and pollen, dried and immediately stained (brushed on, wet on wet). Or does brightening step need to be actioned. Confused on this step, as this is still new, un-oxidized wood. Since it has started to gray/oxidize, you will need the Gemini Restore Kit for the prep. This is both a cleaner and a brightener. Brightener alone will not work.